“Very Best Friend” is the second single release from the upcoming album “All On A Sunday Afternoon” from the Sugar Free Allstars. Below is a sample clip courtesy of You Tube. This song carries such a meaningful message and we are very much looking forward to the album drop currently set for June 12, 2012. If you just take a look at the deliciously colorful album cover of Lucky Diaz and the Family Jam Band’s latest release, “A Potluck,” you will get a sense of how the album feels. It’s bright, bold and filled with tons of charm. Los Angeles-based Lucky Diaz and the Family Jam Band is led by the recently married Lucky Diaz and Alisha Gaddis. 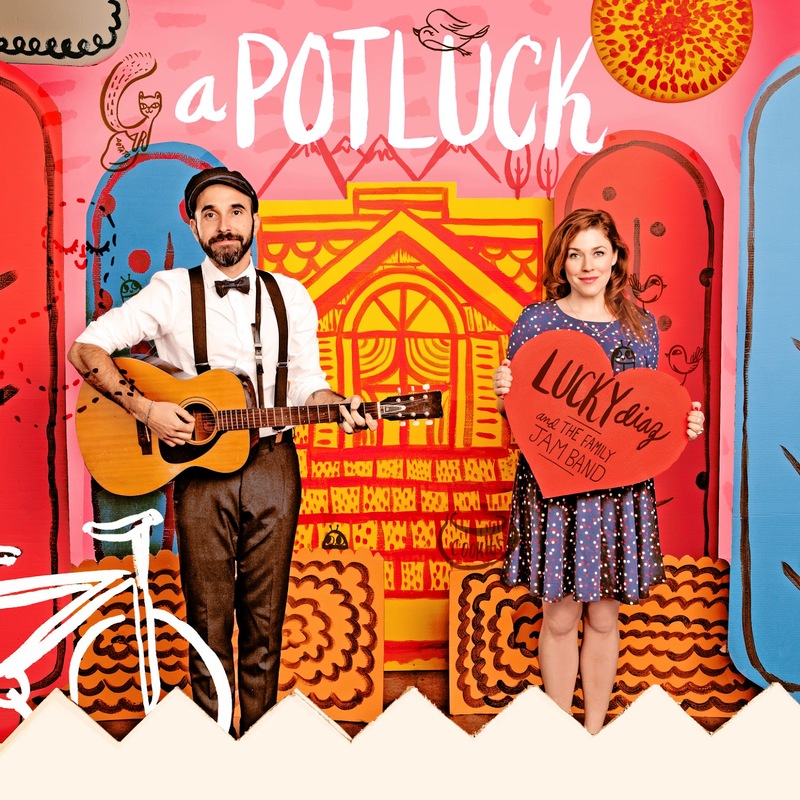 “A Potluck” is their second full-length release which brings us a diverse listening experience made up of many different musical styles aiming to bring fun and delight to children (and grown-ups alike!). Throughout the album, you can feel the pleasure Diaz and his bandmates derive from making good kids music. Each song is like a sweet piece of optimistic pie. Right off the bat, the first 3 songs open the album with true (k)indie-pop flare. Starting with their first single, the electro-pop appetizer “Lines and Dots,” followed by “On My Bike,” which actually includes the sound effect of a bike bell (true bike awesomeness), and “Lemonade Stand” are all hand-clapping, upbeat numbers that are sure to get your body moving. My favorite song on the album is the fiesta filled “Monkey Jones” which includes a solid beat and lots of horns that take you to the Caribbean, dancing barefoot on the beach. Even better is the fact that “Day-O” (The Banana Boat Song) can be heard echoing in the background as the song ends. Kids will also enjoy crowing like a rooster in the swing-a-delic Lil’ Red Rooster and the “meow meow meow” chorus of “Tres Ratones,” which was inspired by Lucky’s Mexican heritage. Although the song is in Spanish, E has already learned the words and exclaims “Oh, this is my song!” every time she hears it. The album wraps up with another poem called “Night” which brings us to the start of the Potluck where people are gathering together for the delicious feast while reminding us that “…we’re all so different but connected every one. We each bring something special to the table and that’s what makes it so much fun.” I love how both “Morning” and “Night” act as a prologue and epilogue, tying the album together while making clever references to either a character or message within a song. I can’t express enough love for Lucky Diaz and the Family Jam Band. Their enthusiasm is infectious and “A Potluck” is sure to be a delicious summer treat! Listen to samples and/or buy/download their album from Amazon here or iTunes here. Read an interview with Lucky and Alisha (courtesy of Dadnabbit) here. 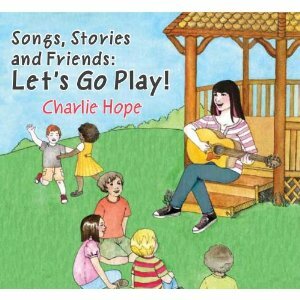 Charlie Hope‘s third release, “Songs, Stories and Friends: Let’s Go Play”, comes at us again with some more charm. This album, like her first album, “I’m Me,” combines familiar classics like a zany “Wheels on the Bus” and “Ants Go Marching,” as well as, lovely originals like “Best friends,” “One That I Love” and “Hot Air Balloon,” some of our family favorites. Where “I’m Me” was a collection of songs, “Songs, Stories and Friends: Let’s Go” is broken up by some spoken word, cheerful verses like “Tiny Tim” and a story called The Bear Family, a tale about Goldilocks and the Three Bears in the city, as told by Charlie’s mom. What I found interesting and unique about this album is that it was designed to be a story in and of itself. The eighth track, aptly named, “Picnic Party,” welcomes us to play some games, sit on a blanket and share yummy snacks while enjoying music by Charlie and some friends. The party starts out in the sunshine and, as such, you can hear kids playing in the background. But then, it starts to rain (which you can hear at the end of the “Tiny Tim” track) and although that would promptly put an end to park fun, it is then that Charlie calls us over to the pavilion to stay dry. While in the pavilion, we are entertained with a jazzy rendition of Robin In The Rain (which some of you may know from Raffi) and a duet with Caspar Babypants whose audible sloshing can be heard as though he is running through the puddles and mud in his froggy boots. The two perform a duet of “Alouette” upon request from a little boy and the party is once again turned into some hand-clapping and foot-tapping fun. The rain finally ends just in time for us to get in our boats and row along with “Row Row.” Hope wraps up with some soft melodies that once again feature her angelic voice encouraging us to remember the fun we had at our party and promising to see us again soon. Charlie Hope once again provides a fun and interactive experience for kids and their families. It’s a party you’ll want to attend over and over again. I can especially see it as a companion for some car rides. Recommended for the 0-5 crew for sure and it would probably even work for slightly bigger ones that are a year or two older. Tracks from the album can be heard here. Songs can also be previewed and downloaded here. Want to fall in love? Perhaps that’s a presumptuous way to start a review about kids music, however, that is what happened when I first heard Charlie Hope. Love, just love. Her soft, enchanting voice instantly transports you to a place filled with flowers and sunshine. In fact, you can even hear birds chirping throughout the album. As a multi-award winning artist, the path that led her to success has been one filled with music, family and children. Hope earned a bachelor’s degree in Art Therapy With Children and has worked in preschools and privately as a nanny. In fact, “Blue Balloon” and “Cowboy Boots” were inspired by a boy she was nannying for at the time the album was being written. Hope’s approach to music is much like her education and experience. “It’s Me” is filled with love and appreciation for who children are as individuals. Imagination makes anything possible and is encouraged while listening to “I’m Me.” The album is interactive and provides a comfortable platform for kids to express themselves in their best animal voices like in the title track “I’m Me,” move their bodies to the beat of a train in “Train Song,” drive a fire truck in “Fire Truck” and even blast off in a rocket ship to the moon in “Zoom Zoom.,” which provides an educational element as Hope counts backwards from 10 to 1 before the rocket takes off. “I’m Me” contains familiar classics like a sweet-as-candy “Mr. 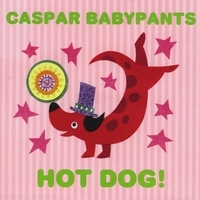 Sun” (which some may recognize from Raffi), “Mulberry Bush” and “Pop Goes the Weasel, as well as, some wonderful originals which address relevant topics like the addition of a new baby and nap time all wrapped up in some catchy hooks that aim to deliver a positive message to little ears. Parents should appreciate the “Frog Song” as Hope starts with 5 frogs and counts backwards to 1 frog while making up random things that the frogs are eating on their log (toast with jam, steamed carrots, edamame and applesauce). Throughout the song, Hope is interrupted by kids pointing out that frogs don’t eat those things until they get to the last frog which correctly eats flies and the children then acknowledge that. We like to turn it into a fun game and change up some of the food the frogs eat. Although, to the 3yr old in our home, poop is apparently something hilarious that frogs like to eat. But that’s a whole other post. 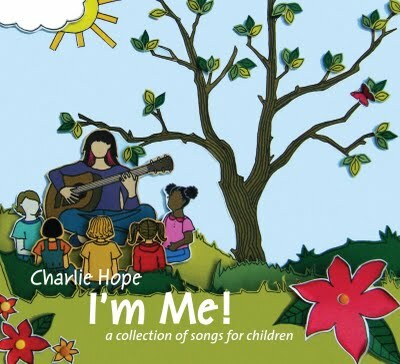 With regard to Charlie Hope, there is something to be said about an artist who wholly understands how essential music is to our well-being and just how much it can educate and empower children. “I’m Me” is a wonderful collection of songs that welcomes acceptance of who we we are while acknowledging the silly we all have inside of us. You can listen to the entire album here and download tracks here. Below is a video for “Train Song” courtesy of You Tube but it is also featured on the main page of Charlie’s website. Sometimes we need a hug, no matter how big or small we are, we just need the warmth of something to surround us and let us know that everything will be ok.
Over the weekend, my 3yr old was overtired and simply tapped out. We are going through the lovely transitionary period where the nap is no longer an option but either is staying up all day. So, last Saturday evening when my daughter couldn’t quite hold it together, she just stood in front of me with tears streaming down her face. She was defeated. So, as we sat on the floor and I held her in my arms, I turned on “It’s A Big World” and for the next 15 minutes we were enveloped in the calming embrace that is Renee & Jeremy. 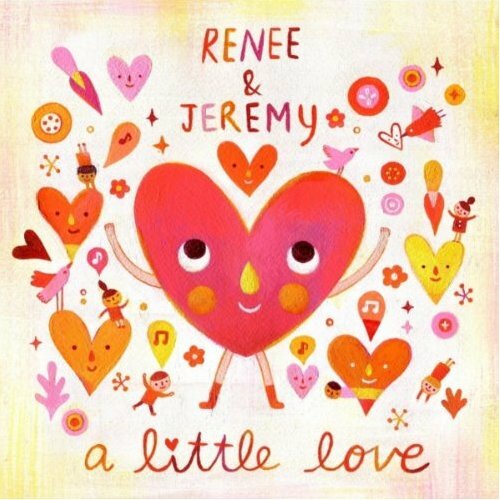 Renee & Jeremy is made up of two wonderful L.A. based artists who, aside from this effort, are parents and solo artists in their own right. One half of the duo is Renee Stahl, who has released solo albums for film, TV and advertising. The other half, Jeremy Toback, current member of Chop Love Carry Fire, released a couple of solo albums in the late 90’s, and formed the band Brad with Stone Gossard of Pearl Jam. As a whole, these two produce soothing sounds that pull you in and sweep you up into an aura of love. 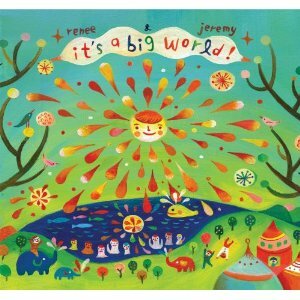 Renee & Jeremy’s debut, “It’s A Big World,” was released in 2007. The first 2 songs written (“Welcome To This World” and “Falling Star Lullaby”) were inspired by Jeremy’s youngest son. What’s even sweeter is that the album was recorded while Renee was pregnant with her first child (they actually recorded the album in the baby’s nursery). Knowing this further increases the depth and sincerity in the sound and spirit of this album. It’s totally authentic and filled with so much love. “It’s A Big World” should definitely be listened to in it’s entirety and on repeat. It is suitable for the 0-5 crowd but can also be heavily consumed by grown-ups whether you are a parent or not. We enjoy it during quiet time and really anytime the environment is calling for a more chilled out vibe, as was the case last Saturday when my daughter was having a rough time. Please check them out and perhaps purchase a copy for yourself and a friend. You can listen to four tracks from this album at the duo’s website. They also have an extra track on their MySpace page. You can get a free download, as well as, purchase digital copies of their album from their website. Non-digital copies of their albums are also available at other regular outlets, i.e. CDBaby and Amazon.